AA6E Station Log: More important than Amateur Radio? very interesting. I stumbled across the article when searching for a solution for my DLP IO 8 problem. so that I can eventually optimize the system and establish a web-based remote control possibility with a second DLPIO. I have designed a data logging program in C for the DLP, which more or less works nicely for Windows. In order to have better Web access (the house is approx. 120 km out of town in a rather remote area) & to use a more energy efficient PC, I would like to move the whole thing to an Asus eee PC (mostly due to its low 12W power consumption) running under Ubuntu Linux. How much power do your machines need btw. ? I would like to use raw mode (2 bytes received per read) rather than canonical. Did you have problems finding the right parameters ? 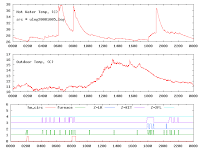 Did you experiment with the stty parameters ? How is the timing of your DLP read ? 30s intervals are rather long as I would miss gale like bursts of wind. I want to have 1 sec intervals. Apparently the DLP temp sensor takes 750 msec for temperature conversion, so I have only intermittent reads on both. Have you had timing issues with the temp sensors ? The Plat'Home Open Micro Server (OMS) requires about 8 watts. It is hard to tell (by heat) if it is powered on! The only negative feature (for me) is price, which is high for "amateurs". If you are interested in the product, I recommend talking to the vendor to see what is possible. Another consideration is that it is "headless" -- no video display -- so you have to work in text-only mode, just like the old days of minicomputers! I use Python, not Perl, and I would be happy to share the code. I do not believe I have published it to the Internet yet, but I may do so. Are you thinking of someone else's project? Yes, I use "raw" (binary) mode. I did not find any special problem there. For my purpose, 30 second sampling is sufficient. You are right that the temp. sensor is slow. I have some troubles with occasional (once or twice a day) wild temp. readings, and I have to retry the reading in that case. (It may be an electrical problem.) You can sample voltage and on/off much faster, of course. I have not tried to see how fast they can go. sorry I get a delivery error when sending to aa6e /at\ arrl.net. Maybe I am just a bit ignorant. I assume it translates to aa6e§arrl.net where § is the asci 40 hex char ? That is the character "@" - which we pronounce "at". The idea is to prevent spammers from grabbing the email address, so we "code" it.